The 486 generation of PC hardware is marked by the wide spread use of SIMM RAM. At first typical System Boards had eight 30 pin SIMM sockets, 30 pin SIMM's had to be used in banks of four, because the devices were eight (nine with parity) bits wide. 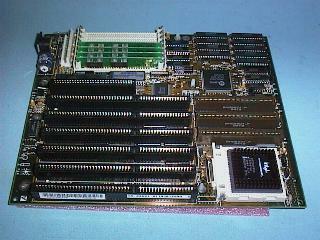 While the 486 processor was still current technology, the 32 (36 with parity) dit wide 72 pin SIMM was introduced. 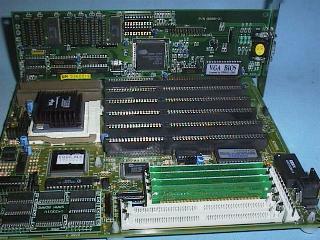 A typical 486 system board with VESA local bus slots. 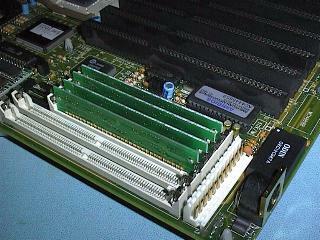 Another close-up view of a VESA video card in a bus slot and an Intel 486 OverDrive processor. The Real Time Clock module and CMOS RAM backup battery. 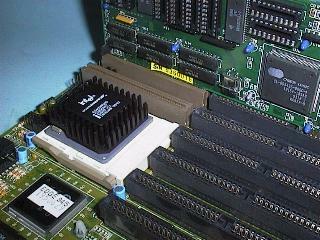 This picture shows a 72 pin SIMM RAM module fitted to the same board. Here is a selection of 486DX2 and DX4 processors, note some have built-in heat sinks, others require a heatsink and fan.